POWER: Integrated Li-Ion-battery for max. 10 hours playtime (USB chargeable using provided USB cable). BAG: a storage/transport bag is included in delivery. Pop-in/-out-mechanic: MOBI is small! Pushing upper and lower part together can further reduce its size to fit in any pocket. The extended mode will guarantee best sound performance due to increased body volume. Integrated Class-D amplifier for excellent acoustic performance (360° sound field). Integrated Li-Ion-battery (USB chargeable) for max 10 hours playtime. 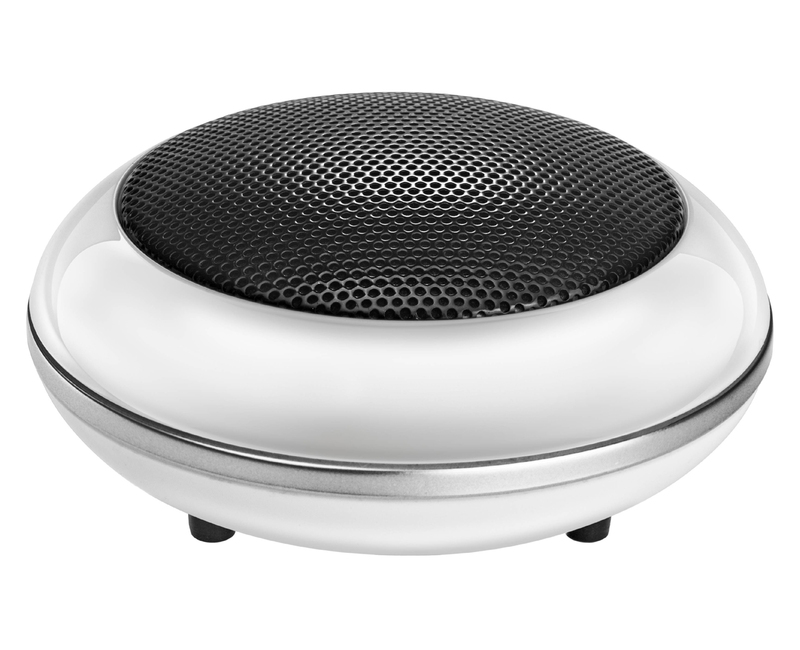 Astonishing sound, elegant and stylish design and quality finish. Fantastic sound! I have tested speakers from Ericsson (MS430) and Philips (SBA3000) but none come close to the sound of this thing. 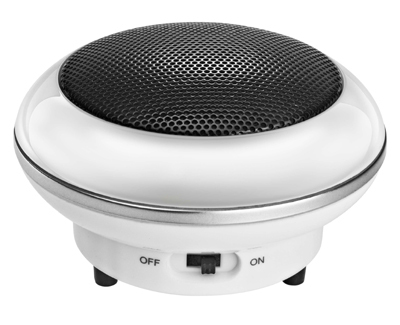 It achieves very loud volume, deep base and a full spectra without distortion. The product has a plastic appearance but it is foldable to half the size and it has a built in rechargeable battery. The 10cm cable is possible to hide in the speaker when it is not used. This little speaker has a very cool look to it and for the size it can deliver some pretty amazing sound when connect to a device, it has worked great on a samsung galaxy s2 phone and makes videos. 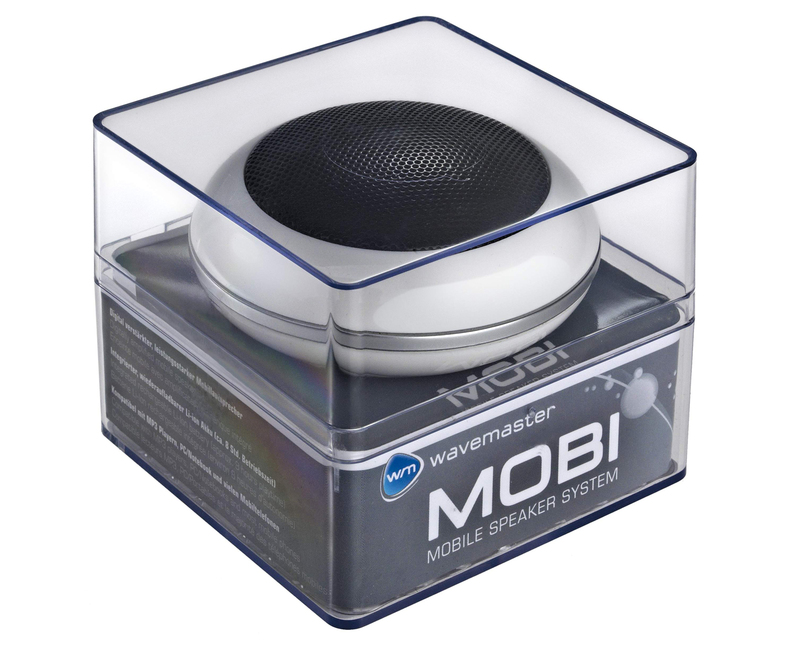 music and gameplay sound great, the portability of this mobi speaker as yoiu can take it along in it's nice pouch that comes with and setup this speaker anywhere. Also i like how it opens and closes to hide the on/off switch and micro USB charging port, and a cool looking blue light underneath to indicate when the speaker is on. Kinda just one as the cord is a little short but this is okay as a person can just get a audio cable to extend it. HIS has made a wonderful product in this mobi speaker and sounds great, i would highly recommend it if you need portable audio sound then this little performer will be right up you alley. Surprising to say the least! I got this little speaker for my brother. He needed something to sit next to his laptop to play music. This guy fit the specs and the budget perfectly. Amazing quality and volume - His laptop was blasting music that was clearer and louder than his previous traditional 2 speaker setup (two 5 inch tall desktop speakers and lots of wires). Charging - Charges super fast and the LED on the bottom changes color to indicate when it is charging. Storage bag - Much like the bag of a certain whiskey, it is a felt bag with a drawstring. The speaker can be tossed in the bag for easy transport with the laptop. 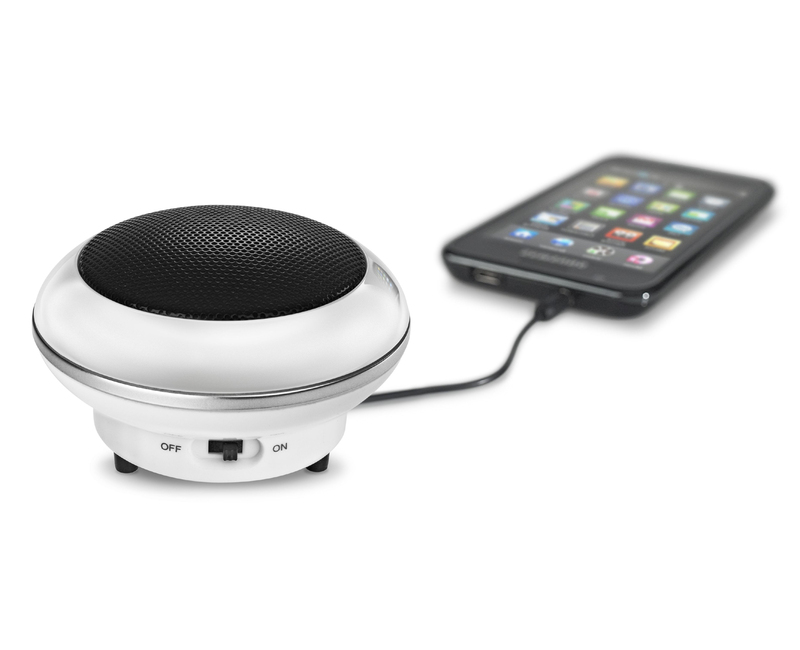 Ease of use - This little guy can be used on numerous devices, and is "plug 'n play". The only con about this little MOBI speaker is the length of the cord, it's only about 3 inches. That's not really a big deal because we needed a speaker to sit directly next to a laptop, and this is what it does (with no excess cords everywhere). Great product, I'd give it a 9.5/10! For the price (or double the price, or triple the price) you can not get a better sounding portable speaker.